I’ve done quite a few potty training book reviews on this blog, so when the author of this book contacted me and asked if I’d like to take a look at her new book, I thought I’d take a little bit of a different spin. I took my six year old to a friend’s house to read with her 22-month-old twins. My son is like a cousin or big brother to these boys, and I thought it would be a lot of fun to see what they did. After all, who better to REALLY review a book than the kids themselves? 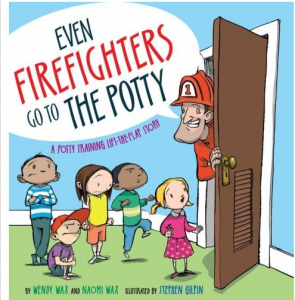 This book is charming, showing all sorts of childhood heroes delaying an event because they need to go potty, from the titled firefighter, to baseball players, to conductors and astronauts. 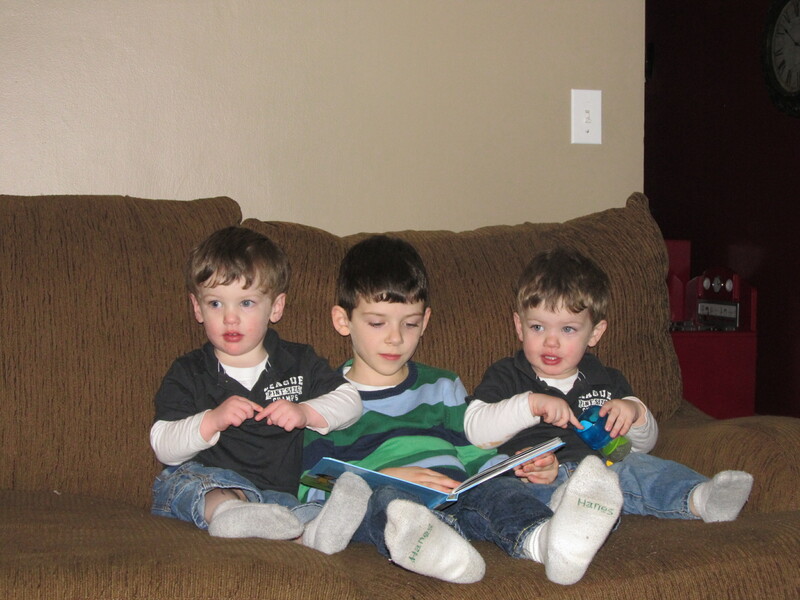 My son giggled through the book as he read, and the twins, generally super active little guys, stayed well tuned in the entire time. The twins sign "train" because, "Even conductors go to the potty!" The illustrations are bright, bold, and engaging, and I particularly like the facial expressions on the characters. Thankfully, the missing waiter is shown washing his hands! We grownups might not want to dwell on it, but even waiters go to the potty too! It’s also a great time to practice the “I Wash My Hands” song, or perhaps talk about how how the characters are practicing “Stop and Go!” (click on each song title to hear clips of these Potty Time songs). My very favorite part of this little activity though had to be when we were done reading and put the book to the side. One of the twins climbed up to the table to read it again, gleefully saying POTTY as he turned each page. I lunged for my video camera and caught a bit of it. Enjoy. Click on the picture to open the video. Potty Time! by Caroline Jayne Church is sure to engage. Each page in this simple board book has one or two lines of rhyme, taking a little boy through going potty and celebrating. This would match up nicely with our Potty Time Flashcards, which you can download for free. There is a button on each page that makes a flushing sound when flushed – something small children love, and parents may view with mixed feeling, depending on your opinion of noisy books! The flush is very soft though, not like some of those other sound books that are so hard on the ears. The book ends with a celebration of potty time and being a big kid, something all young readers will enjoy relating to. A potty training tip: Build on the excitement of the holidays and introduce (or reinforce!) the fun that can be had with potty training. That’s right… potty training can in fact be fun! Are you looking for some gift ideas for the toddler in your life? Be sure to check out all of our potty training book reviews and our awesome collection of Potty Time products. New! The Potty Time Full Collection now includes a potty training guide for parents and teachers! Potty Time Success Story – A Potty Party! Here’s an idea to launch potty training in your house! Why not throw a Potty Time viewing party? Pop up that popcorn, pull out the undies or training pants, grab Hopkins and get ready to celebrate! Recently, one mom shared with us how this played out in her house. Enjoy! Book Review: Where’s the Poop? This book by Julie Markes is a lift-the-flap book that uses animals from all over the world. On each page, a parent animal asks the baby one if they have pooped, and the response is “Yes”. 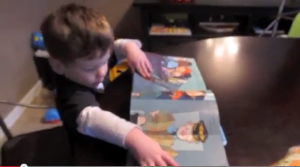 The reader lifts flaps and first discovers different surprises in the environment, and then finally the hidden poop. On the last page, it is a human boy who has pooped, and his can be found (thankfully) in the toilet. This is a very cute book, with sweet illustrations. Animal lovers will enjoy looking at all the baby animals in their habitats with their parents. Children who are a little rougher on their books will probably make short work of the delicate flaps. Wise parents of spirited little children will need to stress that although the animal poop was found in a variety of places, there is just one place for human poop in the house!